Avicii Said "I use Pro Tools to do all my mixing"
In this video of making slide ft. migos, calvin Harris is using Pro tools. From his archived interview with Ableton: "So I used Ableton then to fully structure and lay out a basic rough version of the mix in the Arrangement View, and once the basic structure was done, I piped it via ReWire into Pro Tools for final adjustments." Twenty-three seconds into this video, Axwell points out that they are at the Metropolis Studio in London. Eight minutes into this video in which SHM produces "One", we see Pro Tools running on one of the studio screens. The room in which this video takes place fits the description of Metropolis' Studio E, which lists Pro Tools 10.3.7 amongst its equipment. In the studio, Dave runs Pro Tools 10. He uses various mic pre's and DI's, although his usual choice is the Avalon 737 SP. "We go straight into Pro Tools" Eminems producer is talking about the equipment used to produce Eminem's 2010 album, "Recovery". Ty works on the Pro Tools Software several times during the Joe Moses Studio Session With Tydollasign & AOB video. In this Instagram photo, Matt's Pro Tools session can be seen. RJD2 posts a photo of his DAW session on Twitter, showing he uses Pro Tools for his productions. In an [emusician article](http://www.emusician.com/artists/1333/rjd2---more-is-than-isnt-and-the-mad-men-theme/45928) about the making of his 2013 album [More Is Than Isn't](https://www.youtube.com/watch?v=QXiQsrctShk), he talks about using Pro Tools: “I’ll chop up samples and pitch them to where it sounds natural,” he replies. “I try to keep it at A 440. But sometimes I forget to do that. Some of my older songs are between A and A-flat. Often I will start at 440 as closely as possible and still end up pitching stuff. With analog synths, you have to consider their ability to stay in pitch. I reference things against the Rhodes to know if it’s bang-on in terms of 440. Other times, I’m in the mixing phase and I’ll have to fix the pitch using the pitch shift in Pro Tools.” Since 2013, RJD2 still uses Pro Tools quite a bit. In an interview with [Reverb.com](https://reverb.com/news/reverb-interview-rjd2-on-his-favorite-gear-and-artists-hed-kill-to-work-with), Ramble mentioned that in the new 2016 album [Dame Fortune](https://officialrjd2.bandcamp.com/album/dame-fortune), he had used Pro Tools to record everything in the album. “I write with Ableton as my primary tool, but for mixing it’s all about Pro Tools. It’s a solid program - I’ve been using it for 11 years! When I open it, I enter a different mindset entirely - I get into the mixing zone. I tend to stop writing and actually listen to the sound; I go further into the arrangement and really concentrate on the actual balance.” [Jody Wisternoff](http://www.musicradar.com/news/tech/jody-wisternoffs-favourite-music-software-554186/2). 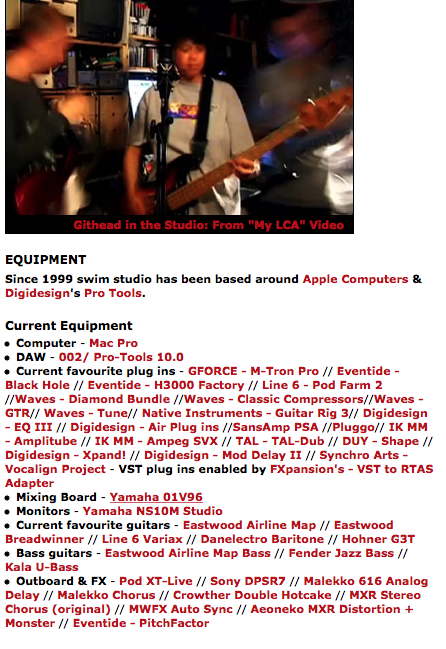 Trevor Horn's Sarm West Coast LA studio uses Pro Tools 10, according to the Sarm website. At 3:10, Daedelus is seen using Pro Tools to edit volumes and listen to his album in the video. According to a list of equipment which is used in his studio, Crowdspacer, Joakim is also a user of Avid Pro Tools 10. On [his website](http://www.colinewman.com/studio.html), Colin Newman lists Pro Tools 10 as his DAW of choice. "I have a Mac and I run Pro Tools 10. I would go up to Pro Tools 11 but with 11 Avid, in typical fashion, stopped supporting the desk I use, my Control 24, and I love that desk, so I’ve stayed with 10 for the time being." Behind the beat video for 50 cent, s1 is using protools. On August 20th 2013, Tinashe shows us her bedroom studio. At 2:13 The Pro Tools interface can be seen on the computer screen behind her. She uploads her Logic Pro-produced beat into Pro Tools and says, "Once you have the beat, put it into Pro Tools, and then you can start recording your song." In Oh No's Rhythm Roulette (by Mass Appeal) he recorded and choped his samples with pro tools. "Ólafur Arnalds still lives and works in Iceland, operating out of a studio complex by the harbour in Reykjavik called E7, which houses various production suites, a mastering room and even a cinema mix room. In his studio, he runs Pro Tools HD 10, using Mytek 192 converters and Barefoot MicroMain 35 monitors." This DAW can be seen in this Instagram picture, uploaded by the artists themselves. Given the date this was posted (January 31st, 2013) it can be assumed they were using the latest version available of Pro Tools, the 10th release, (Pro Tools 10). in this photo use pro tools for his project! He is seen using Pro Tools at 0:57. At 0:07 an instance of Pro Tools can be seen running on the computer monitor. Used for in-studio audio recording and editing. 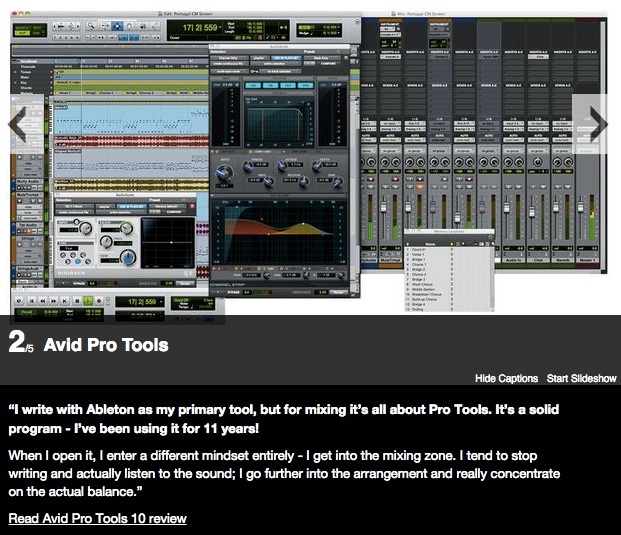 Pro Tools 10 is included in the list of Gareth Jones' software. Mark writes on a 12-core Mac Pro computer running Apple Logic Pro 9. Mark has been a Logic user from the very early Emagic days, and for the super old school guys, Mark was a StudioVision user before that. A second computer, an 8-core Mac Pro, sits at his console running Pro Tools 10HD. This computer runs the video that Mark will score to. Mark uses a very, very long list of plugins, and he is always experimenting with new sounds. so you export stems from Ableton and mix in Pro Tools? Pretty much. But not every single time. I learned Pro Tools in my Recording BA program, so it's just very second nature for me. I'm getting better with Abelton though. Not really my favorite for electronic music work, but a necessity for mastering and signal processing! My current DAW for composition and arrangement. Excellent soft! The hub of all my production and engineering work. Totally trustworthy and very advanced software! Highest performance I've ever seen in a DAW. This is this basis of my existence. Wouldn't mix or track vocals any other way! Been certified on this software since forever. Not much I can say about it other than the brand is proven in the industry and speaks for itself. Wouldn't mix or track vocals any other way! Still the best audio editing/mixing program but I can't help but think that Avid are a massive bunch of cunts. 10HD has never been stable on my system and I now use Logic 10 almost exclusively. This one has RTAS support, and can use more of my old plug-ins that are still used. Its nice and it works. Great tool to edit, and the new real time change gain is the best tool i use all the time! Pro Tools 10 is amazing. I used to record & mix vocals using protools 10. Use pro tools 10 too for mixing. I call it "Slow Tools"
I'm Operator certified in Music and Post Production for Pro Tools 10 and hate it all. But I use it for editing nasty bits of audio sometimes. I've been in forensic audio before and had to use it over Goldwave. With the advent of Pro Tools | First, I might give it another go. Generally it has been trumped by me in every field except recording and editing. it is by far the most powerful and professional in those areas. Avid Pro Tools 10,DJ Tourbillon DAW.